Make a one-of-a-kind note card to send to a friend or create a set of cards for a unique, inexpensive, quick & easy gift. This is a great craft for adult and kids alike. On the next rainy day let your young ones make several sets of unique handmade greeting cards for your last minute gift stash. Versatile & Inexpensive: Your imagination and whatever arts & crafts materials you have lying around the house are the only limits in making and decorating these cards! Easy to Customize for the Holiday and/or the Recipient: Make a dog bone shaped card for the dog lover on your Christmas card list. 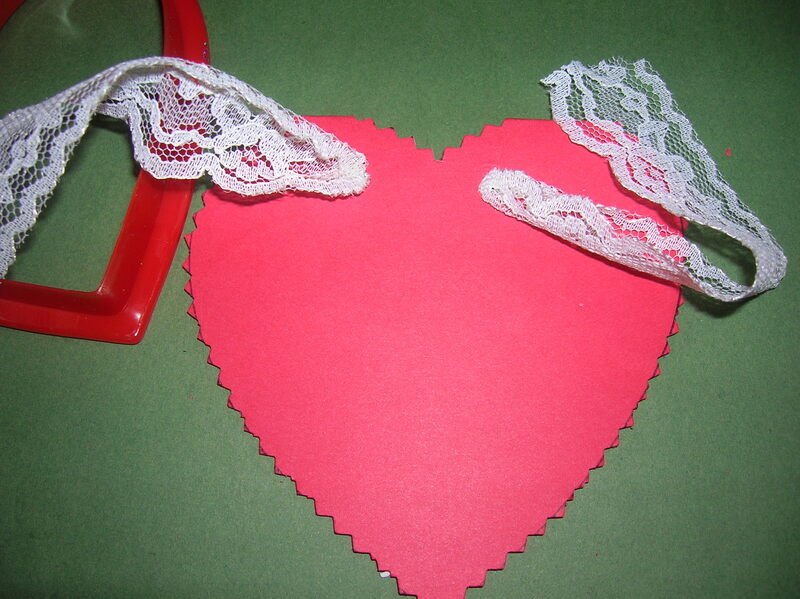 Use ribbon roses, buttons, and lace to make a Victorian heart for your old fashioned Valentine. “Bake” (make) up a batch of sugar cookies for your baking obsessed friend. 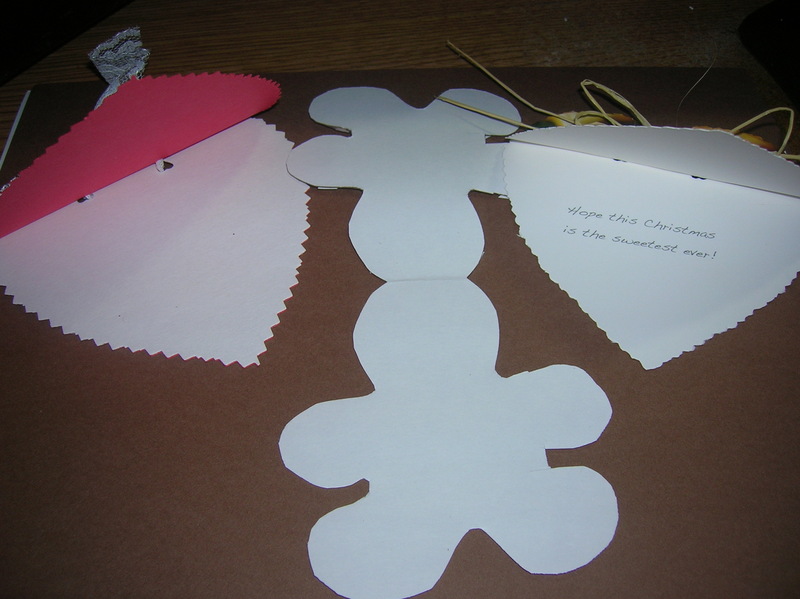 Recycle & Reuse: Give old Christmas & other cards and other cardboard materials a new life. Easy & Fun For All Ages: This project can easily be adapted to any skill level, from beginner to experienced card maker. Create a simple shaped note card or a more complex card with inserts in the middle. Stickers, glitter, tissue paper, etc. The photo tutorial below is for a “sandwiched” or a three layered card created with a blank note card and an index card. Photo 1: Assemble materials. You will need a blank note card (red) and an unlined index card to make the middle of the card (white). Choose the biggest cutter that fits on the card. Insert the white card into the red outer card. 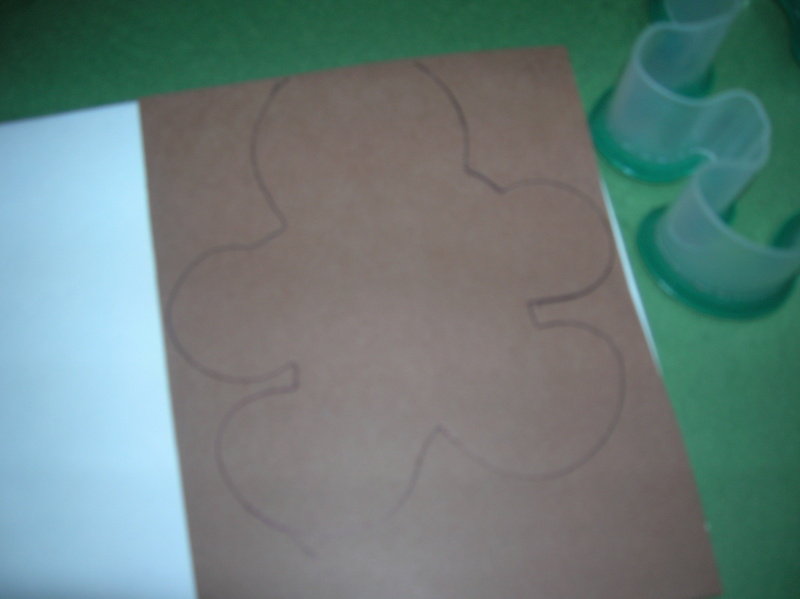 Place the top of cutter along the folded edge of the card and trace the cookie cutter. Photo 2: Use deckle scissors or pinking shears to cut out all three layers at one time. Photo 3: Punch two holes in the top of the card through all three layers. Then thread trim through the holes and tie off. 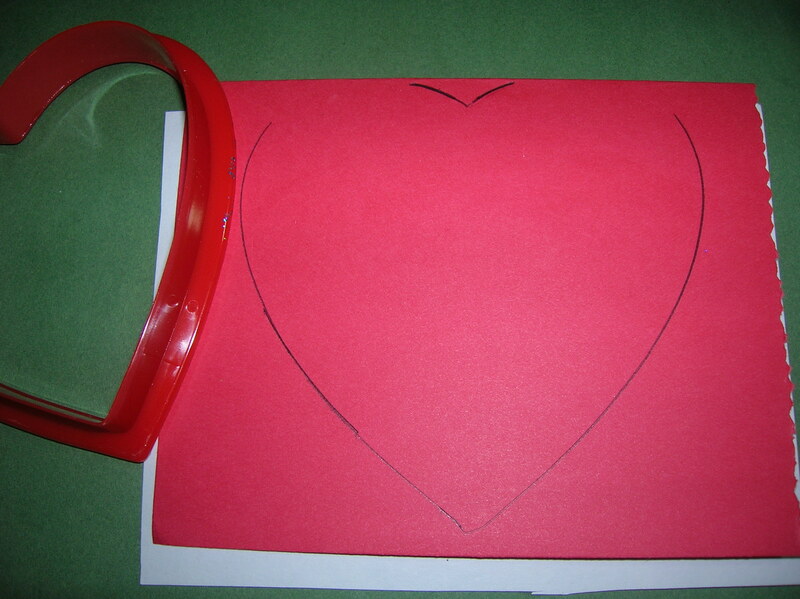 Photo 4: Decorate front as desired and then write your message on the white inner card. Repeat as needed to make the desired number of cards. Photo 5: Glue tan or brown cardstock on the front of a blank card. Then trace and cut out a gingerbread boy. 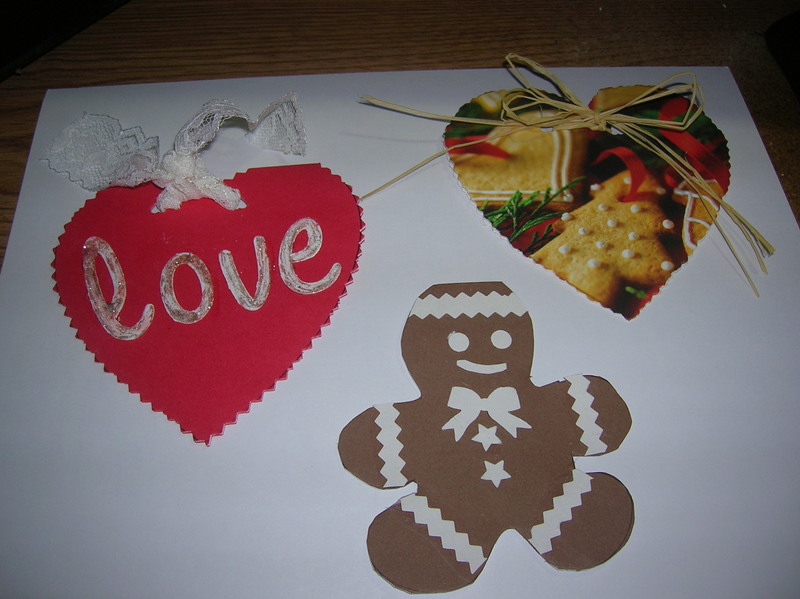 Next add a white “icing” decorations made with white cardstock to create a gingerbread cookie card. Photo 6: Write your message on the inside of the card. Photo 7: Recycle an old Christmas, birthday, etc. card by tracing a shape on the front of the card. Alternate “Sandwich” Card: Another method of creating a three layered card is to use two SEPARATE pieces of colored cardstock for the outer layers (instead of a colored blank card) and unlined index card (for the inside layer). Stack the three pieces of cardstock. Trace the cookie cutter on the top layer. Then cut out the three separate layers at one time. You will then need to join the layers. Punch two holes in the top of the card through all three layers at the same time with a two hole punch. Then thread trim through the holes and tie off. 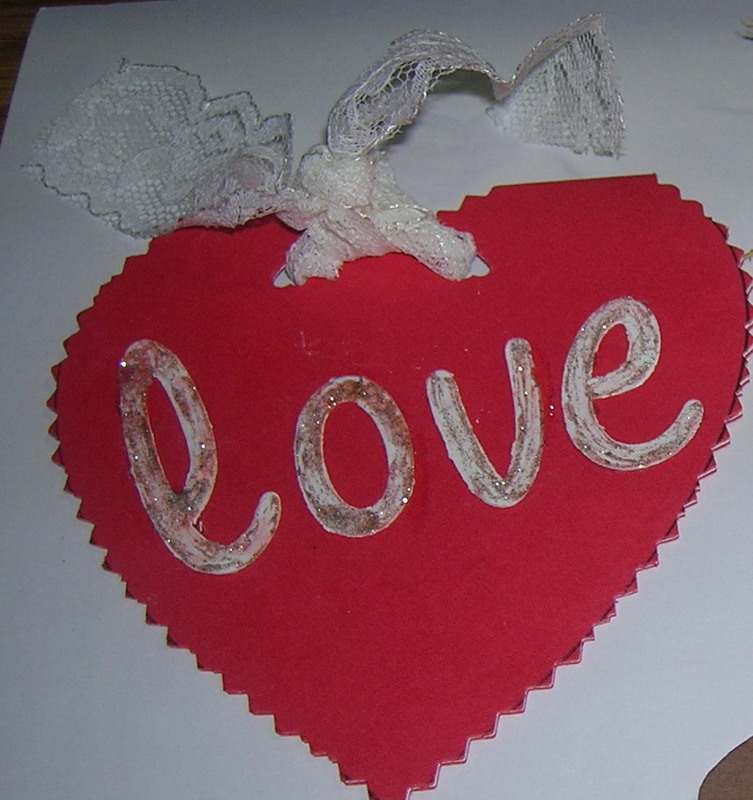 Decorate front as desired and then write your message on the white inner card. 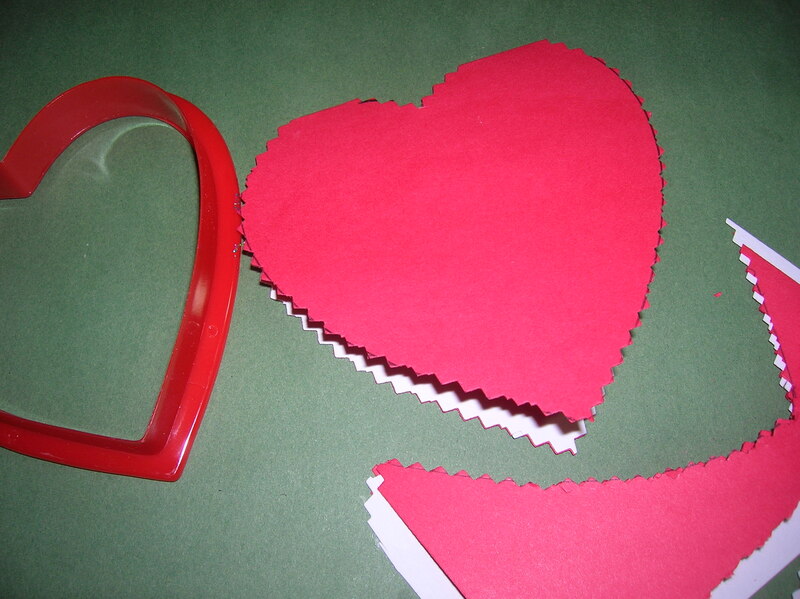 Recycle Old Cards: Recycle an old Christmas, birthday, and etc. card by tracing a cookie cutter shape on the front of the card. Pair it with a piece of plain cardstock or other white cardboard for the back card and cut out the two layers at the same time. Punch holes in the top of the two shapes and join them together with ribbon or other trim. Create Your Own Blank Note Card: Instead of using a pre-made card make your own by taking folding a half sheet of cardstock in half. Inserts: Have more than one sentiment to express? Then don’t limit yourself to just a single middle layer! Decorating Suggestions: Attach small pieces of party streamers or tissue paper in a pattern to create a mosaic. Make a “Sugar Cookie” Cookie Cutter Card by cutting a shape from a tan or brown card as a base and then cutting a slightly smaller white icing shape from white cardstock. Glue it on top of the tan card and then decorate with paper “sprinkles”. Materials: Use crayons, markers, stickers, alphabet stickers, glitter glue, etc. to decorate the card. Consider using craft foam to create and/or decorate a card. Thank you for reading my post. I hope you enjoyed the tutorial. If you have any questions or something is not clear, please let me know so that I can improve the tutorial. Please take a moment to leave a comment and rate this post.